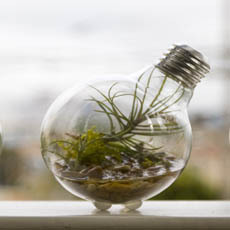 Brighten up your desk or counter with some of these brilliant Light Bulb Terrariums. Made from recycled light bulbs, each tiny terrarium includes tillandsia plants with reindeer moss in river stones, giving them a hip industry meets ecology vibe (kinda like those science fair soda bottles ones you make as a kid, but much cooler). Even without a green thumb it’s easy to keep your terrarium looking green—it just needs partial sunlight and a little bit of water once a week.